Watermelon is typically consumed raw, beautiful and delicious in summer salads, cocktails, or as a chilled soup. I also love to pair watermelon with sharp cheese, the sweet and salty contrast being a lovely match. Look for watermelons that feel heavy and void of soft spots, dents, or cuts. The outside of the watermelon should be dull, not shiny. To tell if a watermelon is ripe, look for a yellow potted hue, where the watermelon rested in the field. (The spot should not be green or white.) Ripe watermelons also sound a bit hollow when thumped. Despite their hard exterior, watermelons can become over ripe quickly. If you purchase an unripe watermelon, leave it on the counter for a few days, up to a week. For ripe watermelons, either purchased or ripened on the counter, cut and transfer to the refrigerator in an airtight container. Prepared watermelon with last for a couple of days. Nothing says summer quite the same as a juicy slab of watermelon. While I don’t cook with watermelon often, we do keep it on hand for snacks. There are too many watermelon varieties to name, but they primarily fit into the four overall categories. Icebox are smaller watermelon, often good for serving just 1 or 2 people. Picnic watermelon are the traditional, 20 pound watermelons that can feed a crowd. Seedless watermelon have been bred more recently to leave out the seeds for easier eating, and the yellow/orange watermelon are just different colors. 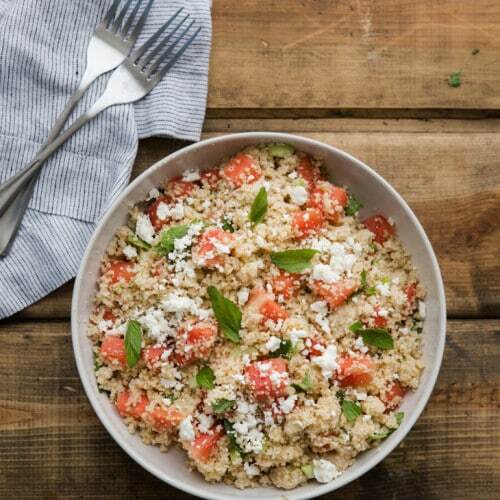 Beyond snacking, watermelon can be cubed and tossed in salads. It’s also wonderful as a chilled summer soup, and even used in place of raw fish in poke. Watermelon can also be grilled and served as a beautiful, refreshing dessert.